After a fortnight sunning himself in the south, French President Emmanuel Macron returns to work in Paris on Wednesday looking to dispel the clouds of a damaging summer scandal and push through a new set of reforms. The 40-year-old has spent his vacation largely out of the public eye with his wife Brigitte at a presidential retreat on the Riviera, emerging only a handful of times looking tanned and relaxed. In between dips in his new swimming pool -- built at the medieval Bregancon fort at his request -- Macron has also been making calls to fellow world leaders Donald Trump, Vladimir Putin and Turkish President Recep Tayyip Erdogan. But it is likely to be domestic, rather than foreign, matters that have weighed on his mind during the languid summer holiday season in France after the first major crisis of his 15-month presidency. Macron was embroiled in July in a scandal involving his one-time bodyguard and senior security aide Alexandre Benalla who was has been charged with assault and impersonating a police officer. Amid suspicions the presidential office hushed up the incident in which Benalla was filmed manhandling May Day protesters, media revelations forced Macron to fire him. But the president then refused to answer questions about what has become a criminal investigation. With his approval ratings already falling, the political opposition sprang into life, using the episode to question Macron's judgement and hammer away at one of his weaknesses: a view among many voters that he is aloof and arrogant. "The impact will depend on how he manages the aftermath, the back-to-work period from now on," said Chloe Morin, a public opinion expert at polling company Ipsos and the Jean Jaures Foundation think-tank. The "Benalla affair" has already sapped goodwill towards the centrist, however, at a time when his government is gearing up for its latest reform push after twice battling -- and overcoming -- resistance from France's trade unions. Labour law was overhauled in the face of protests in October last year, while changes to the state railways were forced through before the summer break despite the longest strike sequence in the network's history. The next struggles will be over other sensitive areas of the French economy and state. A reform of the highly unionised public sector is on the cards, with the government seeking to make greater use of private contractors and raising the prospect of cuts and voluntary redundancies as it looks to make savings. Negotiations will also begin on what could be the most difficult reform of Macron's presidency: an overhaul of the pension system that could see privileges for some sectors of the economy reduced. 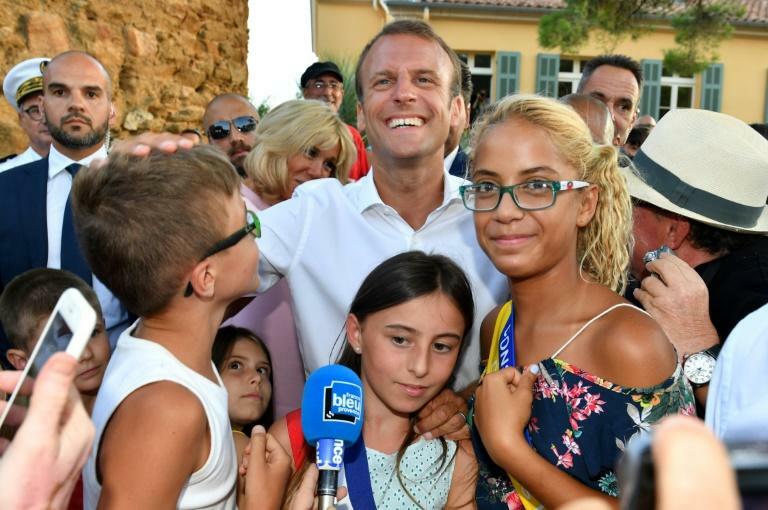 "The message is 'don't think I'm going to give up on anything," Macron told well-wishers during a holiday walkabout in a southern village. "Don't think for second that I'm going to slow down or change course." The backdrop to the new potentially explosive changes has become more challenging, however, because of weakening economic growth. While the French economy expanded 2.2 percent last year, forecasts have been gradually revised down for 2018, with GDP now expected to grow somewhere between 1.6 percent and 1.8 percent. "The heart of his programme has been developing France and getting the economy going again," said Morin. "That's how he has managed to push through some of his reforms so far." If the promised economic growth and new jobs do not materialise -- the unemployment rate has dipped only slightly since Macron's victory in May 2017 -- "then how is he going to explain it? ", asked Morin. Trade restrictions imposed by the US adminstration, higher oil prices, and China's slowing economy have taken a toll on the global economy, but questions are growing about whether Macron's pro-business medicine is working enough at home. Lower-than-expected growth would hit tax income and present the government with a major dilemma as it prepares the 2019 budget: should it deepen controversial cuts in public spending, or borrow more? Borrowing more would undercut Macron's promises to restore order to France's chronically over-stretched public finances and cause problems at the European level. For the first time in a decade, France's budget deficit last year fell below the 3.0-percent limit set by EU law, and Macron has promised to balance the books for the first time since the 1970s by the end of his term in 2022. "Last year, spending cuts, to the housing budget in particular, created controversy and it will be the same this year," business newspaper Les Echos predicted on Monday.